This article is about the disease. For information about the medieval plague, see Black Death. A bubo on the upper thigh of a person infected with bubonic plague. The three types of plague are the result of the route of infection: bubonic plague, septicemic plague, and pneumonic plague. Bubonic plague is mainly spread by infected fleas from small animals. It may also result from exposure to the body fluids from a dead plague-infected animal. In the bubonic form of plague, the bacteria enter through the skin through a flea bite and travel via the lymphatic vessels to a lymph node, causing it to swell. Diagnosis is made by finding the bacteria in the blood, sputum, or fluid from lymph nodes. Prevention is through public health measures such as not handling dead animals in areas where plague is common. Vaccines have not been found to be very useful for plague prevention. Several antibiotics are effective for treatment, including streptomycin, gentamicin, and doxycycline. Without treatment, plague results in the death of 30% to 90% of those infected. Death, if it occurs, is typically within ten days. With treatment the risk of death is around 10%. Globally there are about 650 documented cases a year, which result in ~120 deaths. In the 21st century, the disease is most common in Africa. The plague is believed to be the cause of the Black Death that swept through Asia, Europe, and Africa in the 14th century and killed an estimated 50 million people. This was about 25% to 60% of the European population. Because the plague killed so many of the working population, wages rose due to the demand for labor. Some historians see this as a turning point in European economic development. The term bubonic is derived from the Greek word βουβών, meaning "groin". The term "buboes" is also used to refer to the swollen lymph nodes. 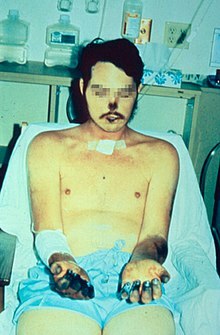 Necrosis of the nose, the lips, and the fingers and residual bruising over both forearms in a person recovering from bubonic plague that disseminated to the blood and the lungs. At one time, the person's entire body was bruised. The best-known symptom of bubonic plague is one or more infected, enlarged, and painful lymph nodes, known as buboes. After being transmitted via the bite of an infected flea, the Y. pestis bacteria become localized in an inflamed lymph node, where they begin to colonize and reproduce. Buboes associated with the bubonic plague are commonly found in the armpits, upper femoral, groin and neck region. Acral gangrene (i.e., of the fingers, toes, lips and nose) is another common symptom. Gangrene of the extremities such as toes, fingers, lips and tip of the nose. Other symptoms include heavy breathing, continuous vomiting of blood (hematemesis), aching limbs, coughing, and extreme pain caused by the decay or decomposition of the skin while the person is still alive. Additional symptoms include extreme fatigue, gastrointestinal problems, lenticulae (black dots scattered throughout the body), delirium, and coma. Oriental rat flea (Xenopsylla cheopis) infected with the Yersinia pestis bacterium which appears as a dark mass in the gut. The foregut of this flea is blocked by a Y. pestis biofilm; when the flea attempts to feed on an uninfected host, Y. pestis from the foregut is regurgitated into the wound, causing infection. Bubonic plague is an infection of the lymphatic system, usually resulting from the bite of an infected flea, Xenopsylla cheopis (the rat flea). In very rare circumstances, as in the septicemic plague, the disease can be transmitted by direct contact with infected tissue or exposure to the cough of another human. 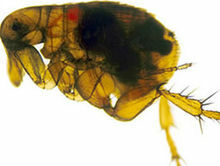 The flea is parasitic on house and field rats, and seeks out other prey when its rodent hosts die. The bacteria remain harmless to the flea, allowing the new host to spread the bacteria. The bacteria form aggregates in the gut of infected fleas and this results in the flea regurgitating ingested blood, which is now infected, into the bite site of a rodent or human host. Once established, bacteria rapidly spread to the lymph nodes and multiply. Y. pestis bacilli can resist phagocytosis and even reproduce inside phagocytes and kill them. As the disease progresses, the lymph nodes can haemorrhage and become swollen and necrotic. Bubonic plague can progress to lethal septicemic plague in some cases. The plague is also known to spread to the lungs and become the disease known as the pneumonic plague. Laboratory testing is required in order to diagnose and confirm plague. Ideally, confirmation is through the identification of Y. pestis culture from a patient sample. Confirmation of infection can be done by examining serum taken during the early and late stages of infection. To quickly screen for the Y. pestis antigen in patients, rapid dipstick tests have been developed for field use. Buboes: Swollen lymph nodes (buboes) characteristic of bubonic plague, a fluid sample can be taken from them with a needle. Several classes of antibiotics are effective in treating bubonic plague. These include aminoglycosides such as streptomycin and gentamicin, tetracyclines (especially doxycycline), and the fluoroquinolone ciprofloxacin. Mortality associated with treated cases of bubonic plague is about 1–15%, compared to a mortality of 40–60% in untreated cases. People potentially infected with the plague need immediate treatment and should be given antibiotics within 24 hours of the first symptoms to prevent death. Other treatments include oxygen, intravenous fluids, and respiratory support. People who have had contact with anyone infected by pneumonic plague are given prophylactic antibiotics. Using the broad-based antibiotic streptomycin has proven to be dramatically successful against the bubonic plague within 12 hours of infection. 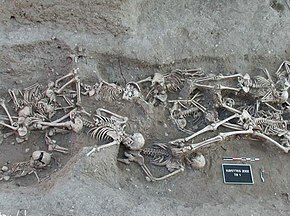 Yersinia pestis was discovered in archaeological finds from the Late Bronze Age (~3800 BP). The first recorded epidemic affected the Eastern Roman Empire (Byzantine Empire) and was named the Plague of Justinian after emperor Justinian I, who was infected but survived through extensive treatment. The pandemic resulted in the deaths of an estimated 25 million (6th century outbreak) to 50 million people (two centuries of recurrence). The historian Procopius wrote, in Volume II of History of the Wars, of his personal encounter with the plague and the effect it had on the rising empire. In the spring of 542, the plague arrived in Constantinople, working its way from port city to port city and spreading around the Mediterranean Sea, later migrating inland eastward into Asia Minor and west into Greece and Italy. Because the infectious disease spread inland by the transferring of merchandise through Justinian's efforts in acquiring luxurious goods of the time and exporting supplies, his capital became the leading exporter of the bubonic plague. Procopius, in his work Secret History, declared that Justinian was a demon of an emperor who either created the plague himself or was being punished for his sinfulness. Citizens of Tournai bury plague victims. Miniature from The Chronicles of Gilles Li Muisis (1272–1352). Bibliothèque royale de Belgique, MS 13076-77, f. 24v. In the Late Middle Ages (1340–1400) Europe experienced the most deadly disease outbreak in history when the Black Death, the infamous pandemic of bubonic plague, hit in 1347, killing a third of the European human population. Some historians believe that society subsequently became more violent as the mass mortality rate cheapened life and thus increased warfare, crime, popular revolt, waves of flagellants, and persecution. The Black Death originated in Central Asia and spread from Italy and then throughout other European countries. Arab historians Ibn Al-Wardni and Almaqrizi believed the Black Death originated in Mongolia. Chinese records also showed a huge outbreak in Mongolia in the early 1330s. Research published in 2002 suggests that it began in early 1346 in the steppe region, where a plague reservoir stretches from the northwestern shore of the Caspian Sea into southern Russia. The Mongols had cut off the trade route, the Silk Road, between China and Europe which halted the spread of the Black Death from eastern Russia to Western Europe. The epidemic began with an attack that Mongols launched on the Italian merchants' last trading station in the region, Caffa in the Crimea. In late 1346, plague broke out among the besiegers and from them penetrated into the town. When spring arrived, the Italian merchants fled on their ships, unknowingly carrying the Black Death. Carried by the fleas on rats, the plague initially spread to humans near the Black Sea and then outwards to the rest of Europe as a result of people fleeing from one area to another. The plague resurfaced for a third time in the mid-19th century. Like the two previous outbreaks, this one also originated in Eastern Asia, most likely in Yunnan Province of China, where there are several natural plague foci. The initial outbreaks occurred in the second half of the eighteenth century. The disease remained localized in Southwest China for several years before spreading. In the city of Canton, beginning in January 1894, the disease killed 80,000 people by June. Daily water-traffic with the nearby city of Hong Kong rapidly spread the plague there, killing over 2,400 within two months. Also known as the modern pandemic, the third pandemic spread the disease to port cities throughout the world in the second half of the 19th century and early 20th century via shipping routes. The plague infected people in Chinatown in San Francisco from 1900 to 1904, and the people of Oakland and east bay again from 1907-1909. During the outbreak from 1900 to 1904 in San Francisco is when authorities made permanent the Chinese Exclusion Act. This law was originally signed into existence by President Chester A. Arthur in 1882. The Chinese Exclusion Act was supposed to last for ten years but was renewed in 1892 with the Geary Act and subsequently made permanent in 1902 during the outbreak of plague in Chinatown, San Francisco. The last major outbreak in the United States occurred in Los Angeles in 1924, though the disease is still present in wild rodents, and can be passed to humans that come in contact with them. According to the World Health Organization, the pandemic was considered active until 1959, when worldwide casualties dropped to 200 per year. In 1994, a plague outbreak in five Indian states caused an estimated 700 infections (including 52 deaths) and triggered a large migration of Indians within India as they tried to avoid the plague. For over a decade since 2001, Zambia, India, Malawi, Algeria, China, Peru, and the Democratic Republic of the Congo had the most plague cases with over 1,100 cases in the Democratic Republic of the Congo alone. From 1,000 to 2,000 cases are conservatively reported per year to the WHO. From 2012 to 2017, reflecting political unrest and poor hygienic conditions, Madagascar began to host regular epidemics. Between 1900 and 2015, the United States had 1,036 human plague cases with an average of 9 cases per year. In 2015, 16 people in the Western United States developed plague, including 2 cases in Yosemite National Park. These US cases usually occur in rural northern New Mexico, northern Arizona, southern Colorado, California, southern Oregon, and far western Nevada. In November 2017, the Madagascar Ministry of Health reported an outbreak to WHO (World Health Organization) with more cases and deaths than any recent outbreak in the country. Unusually most of the cases were pneumonic rather than bubonic. In June 2018, a child was confirmed to be the first person in Idaho to be infected by bubonic plague in nearly 30 years. The scale of death and social upheaval associated with plague outbreaks has made the topic prominent in a number of historical and fictional accounts since the disease was first recognized. The Black Death in particular is described and referenced in numerous contemporary sources, some of which, including works by Chaucer, Boccaccio, and Petrarch, are considered part of the Western canon. The Decameron, by Boccaccio, is notable for its use of a frame story involving individuals who have fled Florence for a secluded villa to escape the Black Death. First-person, sometimes sensationalized or fictionalized, accounts of living through plague years have also been popular across centuries and cultures. Later works, such as Albert Camus's novel The Plague or Ingmar Bergman's film The Seventh Seal have used bubonic plague in settings, such quarantined cities in either medieval or modern times, as a backdrop to explore a variety of concepts. Common themes include the breakdown of society, institutions, and individuals during the plague, the cultural and psychological existential confrontation with mortality, and the allegorical use of the plague in reference to contemporary moral or spiritual questions. Some of the earliest instances of biological warfare were said to have been products of the plague, as armies of the 14th century were recorded catapulting diseased corpses over the walls of towns and villages to spread the pestilence. Later, plague was used during the Second Sino-Japanese War as a bacteriological weapon by the Imperial Japanese Army. These weapons were provided by Shirō Ishii's units and used in experiments on humans before being used on the field. For example, in 1940, the Imperial Japanese Army Air Service bombed Ningbo with fleas carrying the bubonic plague. During the Khabarovsk War Crime Trials, the accused, such as Major General Kiyashi Kawashima, testified that, in 1941, 40 members of Unit 731 air-dropped plague-contaminated fleas on Changde. These operations caused epidemic plague outbreaks. ^ a b c d e f g h i j k l m n o p q r s t World Health Organization (November 2014). "Plague Fact sheet N°267". Archived from the original on 24 April 2015. Retrieved 10 May 2015. ^ a b "Plague Symptoms". 13 June 2012. Archived from the original on 19 August 2015. Retrieved 21 August 2015. ^ a b c d e Prentice MB, Rahalison L (2007). "Plague". Lancet. 369 (9568): 1196–207. doi:10.1016/S0140-6736(07)60566-2. PMID 17416264. ^ a b "Plague Resources for Clinicians". 13 June 2012. Archived from the original on 21 August 2015. Retrieved 21 August 2015. ^ "Plague Ecology and Transmission". 13 June 2012. Archived from the original on 22 August 2015. Retrieved 21 August 2015. ^ Keyes, Daniel C. (2005). Medical response to terrorism : preparedness and clinical practice. Philadelphia [u.a. ]: Lippincott Williams & Wilkins. p. 74. ISBN 9780781749862. ^ a b c "Plague History". 13 June 2012. Archived from the original on 21 August 2015. Retrieved 21 August 2015. ^ LeRoux, Neil (2007). Martin Luther As Comforter: Writings on Death Volume 133 of Studies in the History of Christian Traditions. BRILL. p. 247. ISBN 9789004158801. ^ Edman, Bruce F. Eldridge, John D. (2004). Medical Entomology a Textbook on Public Health and Veterinary Problems Caused by Arthropods (Rev.. ed.). Dordrecht: Springer Netherlands. p. 390. ISBN 9789400710092. ^ "Symptoms of Plague". Brief Overview of Plague. iTriage. Healthagen, LLC. Archived from the original on 4 February 2016. Retrieved 26 November 2014. ^ Inglesby TV, Dennis DT, Henderson DA, et al. (May 2000). "Plague as a biological weapon: medical and public health management. Working Group on Civilian Biodefense". JAMA. 283 (17): 2281–90. doi:10.1001/jama.283.17.2281. PMID 10807389. ^ "Plague, Laboratory testing". Health Topics A to Z. Archived from the original on 17 November 2010. Retrieved 23 October 2010. ^ "Plague – Diagnosis and treatment – Mayo Clinic". www.mayoclinic.org. Retrieved 1 December 2017. ^ "Plague". Archived from the original on 5 March 2010. Retrieved 25 February 2010. ^ "Plague". Healthagen, LLC. Archived from the original on 6 June 2011. Retrieved 4 April 2011. ^ Spyrou, Maria A.; Tukhbatova, Rezeda I.; Wang, Chuan-Chao; Valtueña, Aida Andrades; Lankapalli, Aditya K.; Kondrashin, Vitaly V.; Tsybin, Victor A.; Khokhlov, Aleksandr; Kühnert, Denise; Herbig, Alexander; Bos, Kirsten I.; Krause, Johannes (8 June 2018). "Analysis of 3800-year-old Yersinia pestis genomes suggests Bronze Age origin for bubonic plague". Nature Communications. 9 (1): 2234. doi:10.1038/s41467-018-04550-9. ISSN 2041-1723. PMC 5993720. PMID 29884871. Retrieved 8 July 2018. ^ McCormick, Michael (2007). "Toward a Molecular History of the Justinian Pandemic." In: Little, Lester K. editor. (2007), Plague and the End of Antiquity: The Pandemic of 541–750. Cambridge University Press. (2007). ISBN 978-0-521-84639-4 pp. 290–312. ^ Rosen, William (2007), Justinian's Flea: Plague, Empire, and the Birth of Europe Archived 25 January 2010 at the Wayback Machine. Viking Adult; pg 3; ISBN 978-0-670-03855-8. ^ Sean Martin (2001). Black Death:Chapter One. Harpenden, GBR:Pocket Essentials. p. 14. ^ Nicholas Wade (31 October 2010). "Europe's Plagues Came From China, Study Finds". The New York Times. Archived from the original on 4 November 2010. Retrieved 1 November 2010. The great waves of plague that twice devastated Europe and changed the course of history had their origins in China, a team of medical geneticists reported Sunday, as did a third plague outbreak that struck less harmfully in the 19th century. ^ Benedict, Carol (1996). Bubonic plague in nineteenth-century China. Stanford, Calif.: Stanford Univ. Press. ISBN 978-0804726610. ^ Cohn, Samuel K. (2003). The Black Death Transformed: Disease and Culture in Early Renaissance Europe. A Hodder Arnold. p. 336. ISBN 978-0-340-70646-6. ^ Pryor, E. G. (1975). "The Great Plague OF Hong Kong" (PDF). Journal of the Royal Asiatic Society Hong Kong Branch. 15: 69. ISSN 1991-7295. Retrieved 2 June 2014. ^ "History | Plague | CDC". www.cdc.gov. Retrieved 26 November 2017. ^ Porter, Dorothy (11 September 2003). "Book Review". New England Journal of Medicine. 349 (11): 1098–1099. doi:10.1056/NEJM200309113491124. ISSN 0028-4793. ^ "On This Day: San Francisco Bubonic Plague Outbreak Begins". www.findingdulcinea.com. Retrieved 25 November 2017. ^ Griggs, Mary Beth. "30,000 People in Quarantine After Bubonic Plague Kills One in China". Smithsonian. Retrieved 25 November 2017. ^ "Maps and Statistics | Plague | CDC". www.cdc.gov. 23 October 2017. Retrieved 1 December 2017. ^ a b Filip, Julia. "Avoiding the Black Plague Today". Retrieved 11 April 2014. ^ Regan, Michael. "Human Plague Cases Drop in the US". Retrieved 1 January 2017. ^ "Plague in the United States | Plague | CDC". www.cdc.gov. 23 October 2017. Retrieved 1 December 2017. ^ "Emergencies Preparedness, Response, Plague, Madagascar, Disease Outbreak News | Plague | CDC". www.who.int. 15 November 2017. Retrieved 15 November 2017. ^ "Child in Idaho Confirmed To Have The Bubonic Plague". iflscience.com. ^ "The Independent – 404". The Independent. Archived from the original on 12 September 2011. ^ Daniel Barenblatt, A Plague upon Humanity., 2004, pages 220–221. Alexander, John T. (2003) [First published 1980]. Bubonic Plague in Early Modern Russia: Public Health and Urban Disaster. Oxford, UK; New York, NY: Oxford University Press. ISBN 978-0-19-515818-2. OCLC 50253204. Carol, Benedict (1996). Bubonic Plague in Nineteenth-Century China. Stanford, CA: Stanford University Press. ISBN 978-0-8047-2661-0. OCLC 34191853. Biddle, Wayne (2002). A Field Guide to Germs (2nd Anchor Books ed.). New York: Anchor Books. ISBN 978-1-4000-3051-4. OCLC 50154403. Little, Lester K. (2007). Plague and the End of Antiquity: The Pandemic of 541–750. New York, NY: Cambridge University Press. ISBN 978-0-521-84639-4. OCLC 65361042. Rosen, William (2007). Justinian's Flea: Plague, Empire and the Birth of Europe. London, England: Viking Penguin. ISBN 978-0-670-03855-8. Scott, Susan, and C. J. Duncan (2001). Biology of Plagues: Evidence from Historical Populations. Cambridge, UK; New York, NY: Cambridge University Press. ISBN 978-0-521-80150-8. OCLC 44811929. Batten-Hill, David (2011). This Son of York. Kendal, England: David Batten-Hill. ISBN 978-1-78176-094-9. Archived from the original on 20 May 2013. Retrieved 27 August 2018. Kool, J. L. (2005). "Risk of Person-to-Person Transmission of Pneumonic Plague". Clinical Infectious Diseases. 40 (8): 1166–1172. doi:10.1086/428617. PMID 15791518. 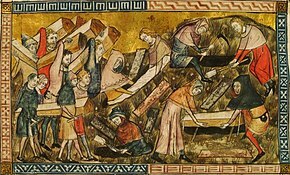 Wikimedia Commons has media related to Black Death.